Platform hitch bike racks support bicycles by their wheels and the bikes sit on top of the racks while the tires are resting in cradles. The risk of bike-to-bike contact is minimized while the tray can be adjusted and eliminates sway issues. Fits 1.25-inch and 2-inch hitch receiver and makes the load and unload way easier compared with other styles. 2-bike platform hitch mount racks can hold almost any bike, from road or mountain bikes to carbon fiber frames, suspension or fat bikes. See a full range of 2-bike platform bike racks or see the best platform bike racks, below. 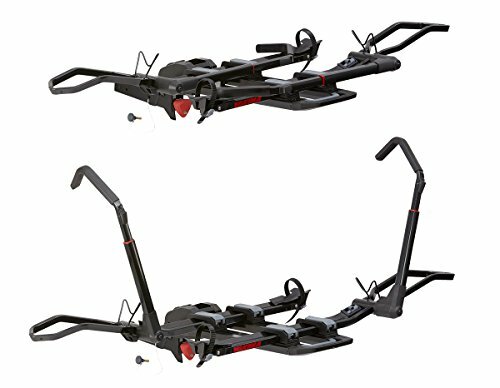 T2 Pro XT is extremely well built and it can be considered the benchmark for hitch bike carriers or by many the best 2-bike platform bike carrier. It is an upgraded version of Thule T2, and it has innovative features, like the remote tilt handle and tool-free vehicle attachment system. It fits 2-inch and 1.25-inch receivers. 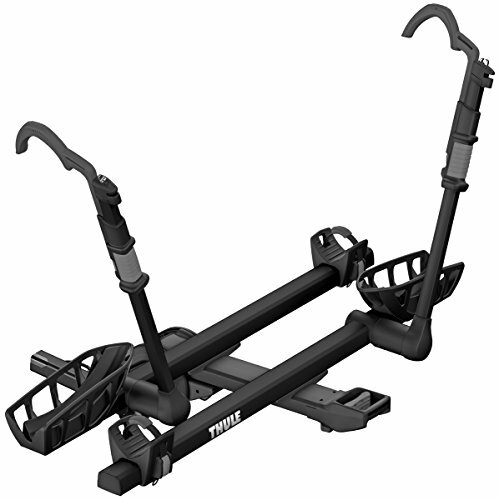 T2 Pro XT is a premium hitch bike carrier being ideal for fat bikes, downhill, carbon frames and mountain bikes and fits 20-29-inch wheels and up to 5-inch tires without adapters. Yakima Dr.Tray is perfect for road, mountain bikes and fat-tire bikes with up to 5-inch tires. It provides 18-inch bike clearance between the trays while the bike tray spacing can be adjusted. You can choose between 1.25 and 2-inch options. A top pick for versatility and capacity, providing an innovative design. 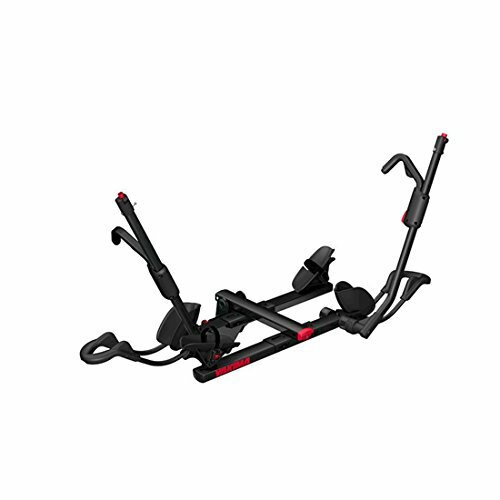 It has similar features as Pro XT from Thule. 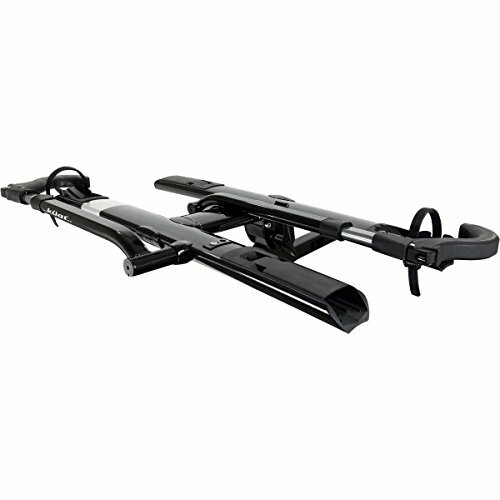 Buzz Rack Express is a quality 2-bike hitch rack that simplifies bike loading. It fits both 1.25 and 2-inch receivers and it folds flat against vehicle when not in use. It features a heavy-duty powder coated steel construction and it weighs 16 lbs. 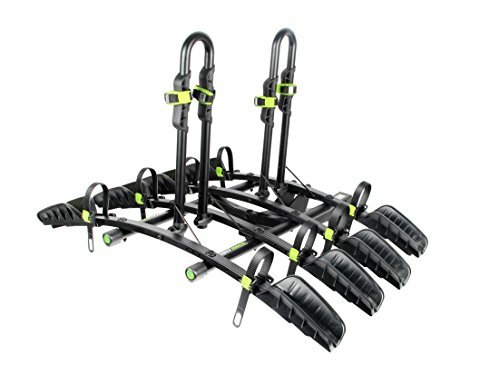 With a simple and stylish design, the Sherpa 2 bike platform hitch bike rack is easy to use and store, especially due to its redesigned pivot with foot assist, the low loading height and the ergonomics of the front wheel clamps and rear wheel straps. The loading and unloading of the bikes is extremely efficient. Fits both 1.25 and 2-inch receivers. A road trip companion for life, Yakima Hold Up 2-bike platform hitch carrier offers excellent ergonomics and a low loading height. The carrier tilts up and down and there is zero contact with the bike frame. The Hold Up is Yakima’s fastest, easiest way to load bikes. Accommodates 20 to 29 wheel tires and it has a load capacity of 49 lbs. A good option for carbon road bikes, disk brakes, thru axles and suspension bikes. 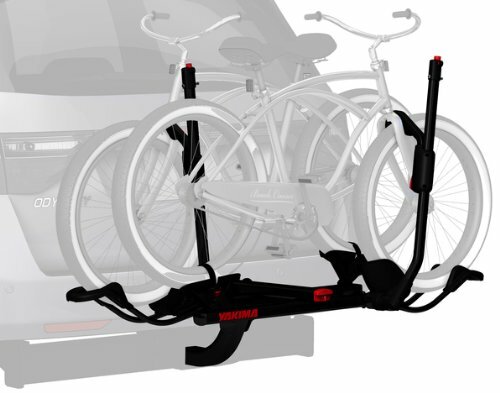 Discover the full range of 2-bike platform hitch carriers. This entry was posted in Platform Bike Racks. Bookmark the permalink.